World Class Hosting Services ~ from $49.00 +gst per month. 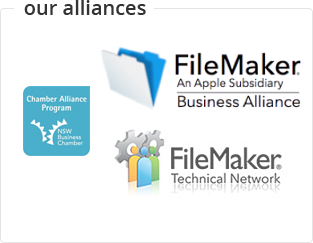 We provide FileMaker Solutions hosting from our dedicated Servers running FileMaker Server. These are located at the world class Global Switch Data Centre in Ultimo, Sydney. Global Switch offers high quality, scalable data centre solutions with access to multiple carriers. The facilities resilience is underpinned by a minimum N+1 standard for power and cooling systems, delivering an optimal operating environment to clients 24×7. All of our servers provide secure access and are configured with SSL AES 256-bit encryption (Server to Web-pages and Server to Clients – FileMaker Pro/Filemaker Go) and have current, valid 3rd Party certificates. FileMaker now offers the ability to configure files to be encrypted “at rest” – meaning the files can also be secured on the local machines or mobile devices. As one of our valued hosting clients, you’ll be able to leverage the infrastructure we already have in place, and take advantage of the benefits of “cloud computing”.